School is over for another year and Kidlet is now halfway through Elementary School. How did that happen? I feel like if I dare to blink I will look up and he will be taller than me and shaving. That whole "they grow up so fast" thing is not a joke. I used to think people who said that were silly but now I know the truth. In celebration of another year well done, I made cupcake cones! 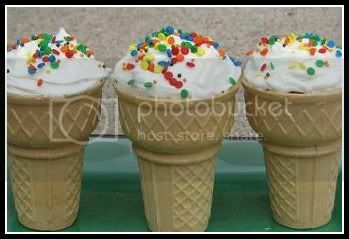 Cupcakes inside an icecream cone, what could be better? Not much in Kidlet's opinion. Make cake mix as directed on box. Arrange cones in a rectangle 9"x13" cake pan. Fill cones 2/3 with cake mix. Bake as directed for cupcakes on cake mix box. Cool, frost, and enjoy. Hi Jenn. This is interesting. Great for parties in school. 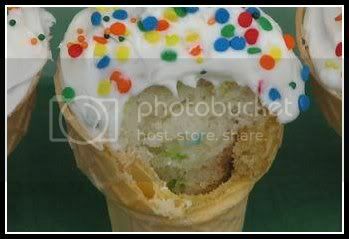 Not sure whether you made use of the cones in lieu of the muffin liners while baking. Thought they would crack out of the heat. Mind to ask oven temp? Yes, I used them instead of muffin liners! The oven temp is 350. I have made them many times and never had them crack, they work really nicely!